30.000 SUPPORTERS as well as 16 groups and Non-Governmental Organizations DEMAND FREEDOM FOR NASRIN SOTOUDEH! On the eve of World Teacher's Day [October 5th, 2012], as countries across the globe prepare for ceremonies in appreciation of our honorable and dedicated teachers, a large number of innocent teachers with an extensive history of service in Iran's education sector remain behind bars because they had the courage to demand that their civil rights be upheld. Honorable Iranian teachers who have dedicated their lives to servicing the educational needs of remote and deprived regions in Iran have now been banned from the teaching profession and deprived of all their benefits and rights. #iran This World Teacher’s Day, Let us be the Voice for the Voiceless and Innocent Iranian Teachers Behind Bars! 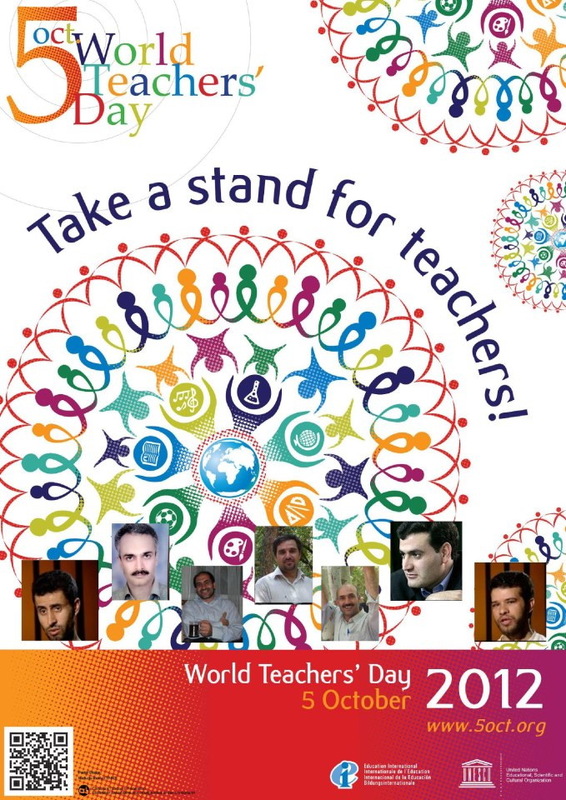 On the eve of World Teacher’s Day [October 5th, 2012], as countries across the globe prepare for ceremonies in appreciation of our honorable and dedicated teachers, a large number of innocent teachers with an extensive history of service in Iran’s education sector remain behind bars because they had the courage to demand that their civil rights be upheld. Honorable Iranian teachers who have dedicated their lives to servicing the educational needs of remote and deprived regions in Iran have now been banned from the teaching profession and deprived of all their benefits and rights. “Abdollah has fifteen years of experience serving the education sector. He has taught in remote areas of Iran such as the Kouhdasht villages and high schools in the province of Lorestan. His salary and benefits were cut off right after he was arrested. Our children no longer have insurance coverage and we have been deprived of all benefits afforded teachers. When he was granted furlough two years ago, he visited the region where he used to teach and he was told that he is no longer needed. As simple as that… ” says Fatemeh Adinehvand the wife of Abollah Momeni, incarcerated teacher, student activist and spokesperson for the Alumni Association Advar Tahkim-e-Vahdat. Rasoul Badaghi is a member of the Board of Directors of the Iran’s Teacher’s Union. Badaghi is currently serving a 6 year prison sentence and has been deprived of all civil activities for a period of 5 years. Despite posting bail, Badaghi’s family insists that he continues to be deprived of furlough. Mahmoud Bagheri sentenced to 9 1/2 years prison, Mohammad Ali Agoushi a retired teacher sentenced to 10 years prison and exile to Zahedan prison are two other teachers currently behind bars because they dared to expressed their civic demands. Abdolreza Ghanbari, middle school teacher, Hashem Shabani Nejad and Hadi Rashedi all three with a long history of service in the education sector and teaching in remote areas of Iran are facing the death penalty while behind bars. Mohammad Davari began his teaching career servicing schools in remote regions in Iran in 1990 while completing his MA in Educational Administration. While studying for his MA, Davari began to teach and commenced his journalism career by publishing a variety of newspapers, magazines and website. Davari was also active in the establishment of teacher’s trade associations and was arrested and sentenced while attending the teacher’s demonstrations that took place in February 2007. Following the controversial presidential elections in 2009, Davari was once again arrested enduring more than 11 months of physical and psychological pressures at Evin prison’s ward under the supervision of Iran’s intelligence ministry. Davari was eventually transferred from Evin’s security ward to the general ward in August 2010 and sentenced by the illegal Revolutionary Courts to 5 years prison and a $5000 dollar fine for participating in the post election demonstrations. “Ever since Mohammad has been in prison he has developed a number of ailments. We managed to get him a doctor’s appointment to treat his heart condition and other physical ailments. The authorities however decided to take him to another doctor without coordinating with us and later informed us that after spending a few hours at the doctor’s office, the doctor did not show up and Mohammad was returned to prison. How is it possible for them to take a political prisoner to a doctor without coordinating with his family? Mohammad continues to suffer from the same ailments and we have obtained yet another doctor’s appointment for him. We’ll see if the authorities give him permission this time around. So far they have not even granted him medical furlough.” adds Biyabani while pointing to her son’s physical ailments. The pressures on Iranians serving the educational sector is not limited to prison sentences, death sentences and being banned from the teaching profession. Many teachers have open cases filed against them. Their every move is being watched and the slightest civic activities can lead to their arrest and incarceration. Shahou Hosseini, Abdolvahed Maroufzadeh, Ali Beshararti, Mozafar Sharifi , Razgar Sharifi, Ali Akbar Baghani, Mohmoud Beheshti Langeroudi, Mokhtar Asadi, Amir yaghinlou, Mohammad Jamal Heyki, Ali Reza Hashemi, Ahmad Medadi, Bagher Fathali Beygi, Zahra Hatami, Ali Najafi, Asghar Mohammad Khani, Saeed Jahan Ara, Alyas Talebi, Mohsen Jeldyani, Javar Ebrahimi Azandaryani, Tofigh Mortezahpour, Mohammad Farjiyan, Mohammad Ali Shirazi, Masoumeh Dehghan retired teacher and her husband Abdolfatah Soltani, Hossein Taraghi Jafari, Mohammad Reza Rezaii Gorgani. چکیده :تعداد زیادی از معلمان با سوابق طولانی خدمت در آموزش و پرورش ایران به جرم طرح مطالبات صنفی خود در پشت میله های زندان بسر می برند. معلمان دربندی که پس از سالها خدمت در مدارس مناطق محروم کشور با صدور حکم اخراج از کلیه مزایای معلمی محروم شده اند…. در آستانه روز جهانی معلم (پنجم اکتبر)، مقام های عالی کشورهای دنیا در حال برپایی مراسم های ویژه ای در تجلیل و تقدیر از مقام معلم هستند. این در حالیست که تعداد زیادی از معلمان با سوابق طولانی خدمت در آموزش و پرورش ایران به جرم طرح مطالبات صنفی خود در پشت میله های زندان بسر می برند. معلمان دربندی که پس از سالها خدمت در مدارس مناطق محروم کشور با صدور حکم اخراج از کلیه مزایای معلمی محروم شده اند. رسول بداقی، عضو هیات مدیره کانون صنفی معلمان مدتی پیش حکم اخراج خود از آموزش و پرورش را دریافت کرد. وی در حالی دوران محکومیت خود را سپری می کند که علی رغم سپردن وثیقه نتوانسته به مرخصی بیاید و به گفته خانواده او، با مرخصی اش مخالفت می کنند. محمود باقری با حکم نه سال و نیم حبس تعزیری، محمد علی آگوشی، معلم بازنشسته با حکم ده سال حبس همراه با تبعید به زاهدان از زندانیان دیگری هستند که تنها به جرم طرح مطالبات صنفی خود در زندان بسر می برند. همچنین عبدالرضا قنبری، آموزگار مدارس پاکدشت، هاشم شعبانی‌نژاد و هادی راشدی سه معلم دربند دیگر هستند که با سابقه طولانی تدریس در مدارس محروم کشور هم اینک با حکم اعدام روزهای سختی را در زندان سپری می کنند. محمد داوری از سال ۶۹ حرفه معلمی را با تدریس در مدارس مناطق محروم کشور آغاز و همزمان مدرک کارشناسی ارشد در رشته مدیریت آموزشی را اخذ کرد. در دوران دانشجویی، در کنار حرفه معلمی به خبرنگاری روی آورد و در روزنامه ها، نشریات و سایتهای مختلف خبری مشغول به فعالیت شد. وی همچنین در قالب تشکل صنفی سازمان معلمان ایران فعالیت کرد و به خاطر حضور و فعالیت در تجمع های اعتراضی معلمان در اسفند سال ۸۵ بازداشت و محاکمه شد. پس از انتخابات ریاست جمهوری سال ۸۸ بار دیگر بازداشت و بیش از یازده ماه را در بندهای امنیتی اطلاعات تحت فشارهای جسمی و روحی قرار گرفت. این روزنامه نگار در مرداد ماه سال ۸۹ از بند امنیتی به بند عمومی ۳۵۰ انتقال یافت و در دادگاههای غیرقانونی به پنج سال حبس تعزیری و پنج میلیون تومان جریمه بدل از حبس بابت تجمعات سال ۸۸ محکوم گردید. Thursday, Sept. 13, the University of Tennessee Film Committee screened the documentary, "This is Not a Film" in the UC auditorium. "This Is Not a Film" follows Iranian director Jafar Panahi after he receives a six-year prison sentence and a 20-year ban in filmmaking due to his open support of the opposing party in Iran's 2009 election. The documentary follows Jafar Panahi as he awaits his fate on his appeal. "We chose this film because each semester, the Film Committee tries to show one documentary," explained Christina Townsend, the vice chair of the Film Committee. "'This Is Not A Film' really gave insight into his thought process and how stifling it is to have your mode of expression oppressed," said Jessica Covington, Film Committee chairperson. "It becomes clear that he is more concerned about not being able to make movies than his prison sentence." This Is Not a Film: A look inside the censorship of expression. A day-in-the-life of a film-maker who is banned from what he loves the most. Alles Aktuelle vom Pressedienst des Europäischen Parlaments: Abstimmungen, Entschließungen, Aussprachen, Ausschüsse und Plenartagungen. Speaking of Sotoudeh’s physical condition, Khandan told the Campaign, “She is so weak and skinny, she is hardly recognizable. رضا خندان در پاسخ به آخرین وضعیت جسمی همسرش به کمپین گفت: « آنقدر لاغر و ضعیف شده است که به سختی دیگر قابل شناسایی است. Nasrin Soutodeh and Iranian filmmaker Jafar Panahi together represent one of the five nominees for the Sakharov Human Rights Prize. The five finalists for the European Union Human Rights Prize, known as Sakharov, were announced in the last few days. Nasrin Soutodeh and Jafar Panahi, the Iranian filmmaker sentenced to six years in prison and a 20-years ban on filmmaking, foreign travel, and interviews with domestic and international media outlets, are jointly one of the five nominees for the prize. The winner of this year’s award will be announced during an official ceremony in the city of Strasbourg, France, on October 23, 2012. Amnesty International Norway's youth group is hosting a photo campaign from September 13-27 in support of the Iranian defense lawyer, Nasrin Sotoudeh, who has been imprisoned for defending women's rights. In January 2011, she was sentenced for having "acted against national security" and for "promoting propaganda against the system". The original sentence of 11 years of prison has been reduced to 6 years after appeal. She has also been denied permission to practice as a lawyer for 10 years. embassy in Oslo, Norway. Take a picture of yourself, alone or with friends. Help spread the photo campaign to people around you and be creative in your methods. The pictures will also be posted Flickr.com for public display, before the collage is completed and sent. 1. Take a picture of yourself with a visible "Free Nasrin"-message. 2. Send you picture to freenasrin@gmail.com and write which country and city you are in. 4. Tell other people about Nasrin's situation and urge them to take part in this phtoto campaign as well! PS. If anyone wants to contribute with their photo, without having it posted on Flickr.com, let us know in the email. Amnesty International Norway's youth group is hosting a photo campaign from September 13-27 in support of the Iranian defense lawyer, Nasrin Sotoudeh, who has been imprisoned for defending women's rights. In January 2011, she was sentenced for having "acted against national security" and for "promoting propaganda against the system". The original sentence of 11 years of prison has been reduced to 6 years after appeal. She has also been denied permission to practice as a lawyer for 10 years. By sending a photo of yourself with a "Free Nasrin"-message on a poster or written in the palm of your hand, you contribute in the making of a collage which will be sent to the Iranian Secularism II embassy in Oslo, Norway. Take a picture of yourself, alone or with friends. Help spread the photo campaign to people around you and be creative in your methods. The pictures will also be posted Flickr.com for public display, before the collage is completed and sent. We want as many photos as possible, so every contribution is appreciated. By sending your photo you support Amnesty International's demands on Nasrin being released immediately and unconditionally. Follow these steps to take action: 1. Take a picture of yourself with a visible "Free Nasrin"-message. 2. Send you picture to freenasrin@gmail.com and write which country and city you are in. 3. Follow the updates on our Flickr-page, where all pictures will be posted: www.flickr.com/freenasrin 4. Tell other people about Nasrin's situation and urge them to take part in this phtoto campaign as well! PS. If anyone wants to contribute with their photo, without having it posted on Flickr.com, let us know in the email.